​If you have a food dehydrator in your home, you will not only eat delicious snacks but also the healthier one. There are lots of features that you must consider while buying a food dehydrator for yourself. One such feature is, food dehydrator with timer and temperature control. ​A timer in food dehydrators plays a very important role if you have a busy hectic schedule throughout the day. When you switch ON the timer and set the time accordingly, then there is no need to stand nearby the appliance. ​You can carry on with your daily routine work with full ease and comfort as the dehydrator will shut down automatically when your dried food item gets prepared. This feature is not available in all the food dehydrators, so some of the people have to buy this additionally for themselves. ​Now, on the other hand, the temperature control or adjustable thermostat means that you can control or set the accurate temperature in the dehydrator as per the nature of the food. ​For example, hard food items like meat or jerky require high temperature for drying out but subtle food like spices or herbs need very less temperature for cooking. This feature enables you to stop the over-drying of the food by setting up the required temperature in advance. ​Well, The main benefit which you get from these two features is the better control over your appliance while drying out the food in it. ​The first name in the list is of Excalibur 3926 TB Food Dehydrator which possesses the huge capacity as well as the finest features. This Excalibur 9 tray dehydrator with timer and temperature control is one of the top retailing models which offer you fifteen sq. feet of the dehydrating space along with an adjustable temperature control as well as the automatic timer. The manufacturers of this product i.e. Excalibur is well-renowned for their amazing products in the market. This appliance is also a high-quality and long lasting product. There is lots of space on the trays for drying out the food and it works amazingly during in big parties and family get-together. The adjustable temperature control feature of this appliance functions incredibly and you can set it as per your requirement. There is a timer along with the automatic shut-off option so that you can easily carry out your daily routine work side-by-side. You can also place thick and tall food items in this 9 tray excalibur dehydrator with timer and temperature controller just removing the upper trays in order to increase the existing space. The cost of this appliance is little expensive as compared to the dehydrators which do not have any timer or adjustable thermostat feature. This Excalibur food dehydrator is little noisy also. You will not get any solid sheets for drying out the drippy foods or fruit leathers. The controls are positioned on the back side which can be little inconvenient to the user who has placed it below the cabinet of the kitchen. ​This food dehydrator is manufactured by the TSM Products Company which manufactures an extensive variety of proficient meat processing equipment. The TSM ﻿﻿5 - Shelf Stainless Steel Food Dehydrator includes the features like top-fixed controls, outstanding design as well as five stainless steel trays. Besides this, you will also get a timer and temperature control feature in this. The main advantage of this product is that it is manufactured from the stainless steel which is easy to clean and also looks very elegant. This is a nice-looking dehydrator along with the commercial kitchen designing. It is made up of stainless steel which is durable as well as hygienic. An integrated 12-hour timer along with the automatic shut off and the adjustable thermostat feature are also given. It does not provide the additional accessories such as leather trays or mesh screens. The product is expensive as compared to space which it offers. ​If you are searching for a super powerful food dehydrator, then STX INTERNATIONAL Dehydra STX-DEH-1200W is a perfect choice for you. It possesses a 1200 watt capacity power along with the adjustable thermostat ranging between 95 degrees to 155 degrees that are optimal for drying. Besides this, the appliance provides 16 sq. feet of dehydrating space in addition to the ten sturdy stainless steel trays. 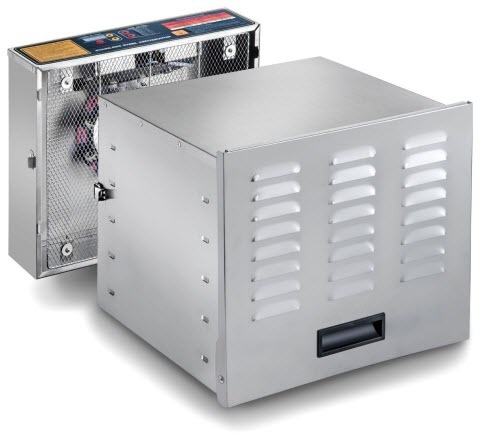 This big size food dehydrator consists of a 12-hour shutoff timer for the user’s convenience. This food dehydrator has 16 square feet of dehydrating space which are quite sufficient for the big size family. This product is manufactured from the strong stainless steel material that makes it a rugged component which is different from the plastic models available in the market. It is quite easy to clean the dehydrator owing to the stainless steel wipe clean and there are no chances of dripping inside due to the presence of a drip tray. Even though its look like an industrial unit but it still looks elegant in a modern kitchen. It is very easy to assemble and disassemble this appliance if you are not using it. This also benefits in easy storing. This food dehydrator is reasonable to buy. The ends of this product are little sharp, so the user needs to take care of that while moving it from one place to another. This product can be slight noisy which you may also found in other similar models. Sometimes the temperature set does not work appropriately as per the setting. If you plug in the power cord of the appliance in an extension cable, then the voltage of your place can get a drop. It is better to use the power socket while using the dehydrator. ​The next name in the list is of the Presto 06301 Dehydro Digital Electric Food Dehydrator which is a six tray dehydrating system. It is intended to provide the user value of his money spent. It weighs only 8.5 pounds which are quite lightweight to move. It also offers big drying space for diverse kinds of foods in one single point of time. As soon as the trays are placed along with the foods to be dried, all the food will get evenly dried with the help of the fan that rotates the heat over all the trays uniformly. It is very easy to set the dehydrating temperature as well as the time with the assistance of the adjustable thermostat and the timer respectively. It takes only a few hours to dry out the food completely. There is no need of rotation of trays due to the existence of the fan at the back. It offers constantly dehydrated and appetizing food. It does not require large space over the countertop of your kitchen. It is reasonable than the other similar models available in the market. The construction of this appliance is not done from the robust material which makes it less durable for the longer time period usage. The extra trays or the accessories (if you wish to buy) also obtainable at higher rates. This appliance is not appropriate for the people who want to dry out lots of food on one single point of time. Nesco FD - 1040 1000 Watt Gardenmaster is one of the amazing appliances which not only works professionally but also completes the process the food effectually. With this dehydrator, you will easily get rid of the dried foods which you need to purchase from the market at very high cost. This nesco dehydrator is quite spacious for providing dried food to an average size of a family. The existence of its top-notch features also helps in making your dehydration experience more enjoyable. It offers a lot of dehydrating space and you can increase the number of trays as per your need. You can dehydrate a diversity of foods in this appliance with the support of the adjustable temperature control system. It offers long dehydrating time period of 48 hours. 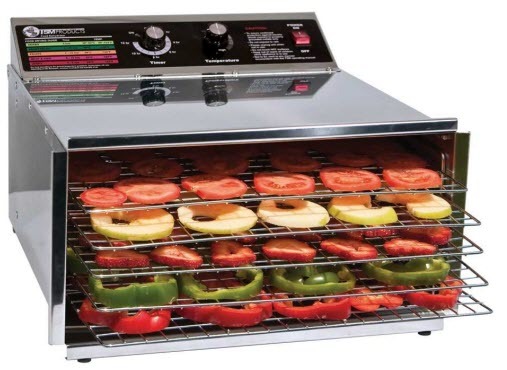 This dehydrator is powerful enough to dehydrate vegetables and beef jerky. You can easily set the drying time with the help of the digital timer. It preserves more food flavor, nutrients and taste owing to the vita-save interior. There is no need of rotation of trays in this and the trays are also dishwasher safe. It comes with a recipes and instruction booklet. This is the quietest food dehydrator which is accessible in the market. The additional trays (if required) come at an extra cost. It is not appropriate for the users who want to make bulk food in one go. There are few accessories that need to be bought if you want to dehydrate the non-solids. 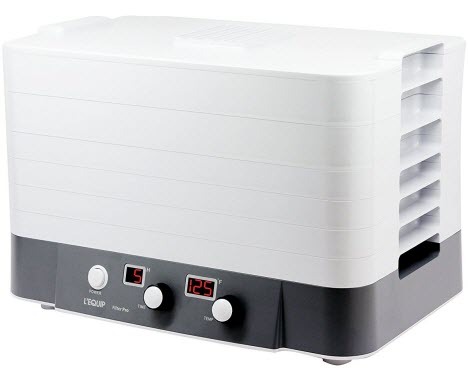 The Excalibur 3948CDB is exclusive food dehydrator which comprises of all the top traditional features, together with a transparent door, a 48 - hour timer, as well as a temperature controller. 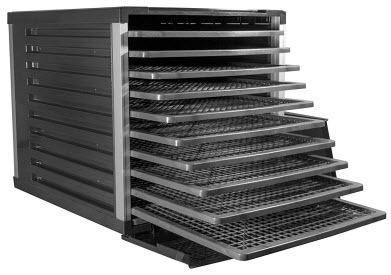 This is a shelf-style dehydrator which offers more drying space to the users as compared to the stacked food dehydrators. You can also increase the space for big size food items (like dough) inside the appliance by removing the trays which are not required. There is ample of tray space which is good for the regular and heavy users. The adjustable thermostat feature allows the processing of all kinds of foods i.e. from hard foods like meats to more subtle items like herbs. The appliance gets automatically shut down. The see-through door of this dehydrator helps in checking the foods that are getting processed and you can also remove it for easier loading and cleaning. The trays are also removable so that you can dry out tall or heavy food items. A booklet including all the relevant information along with the recipes is also provided. This product is little expensive than the similar models accessible in the market. The solid tray liner sheets need to be bought distinctly. The controls of the appliance are located at the back which might be inconvenient to the user. The LEM Products 10 Tray Food Dehydrator with digital timer possesses an 800 watts power capacity which makes it quite powerful. This also benefits in the much more quickly drying of the food. Along with the 15 square feet of dehydrating space and 10 trays, this product also possesses the highest capacity. You can easily cook larger quantities of food simultaneously. The main USP of this appliance is its digital timer and adjustable thermostat feature. Besides this, it devises a powerful back-mounted fan which dispenses the air uniformly all over the trays. It offers large drying space of more than 15 sq. ft. There is an inbuilt digital timer for more assistance of the user. There is a power switch along with a long power cord is provided. The price of this food dehydrator is also reasonable. The temperature controlling knob allows setting the drying between 85 degrees F to 155 degrees F.
You will not get any fruit leather sheets or mesh inserts with this product. 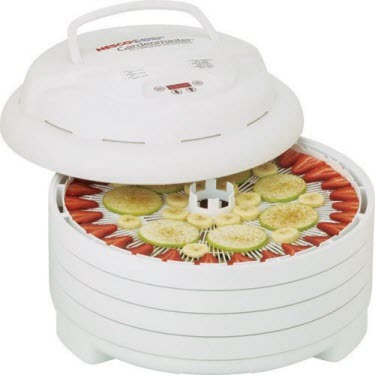 The Nesco American Harvest FD-1040 Gardenmaster Food Dehydrator comes with four trays in addition to the accessories. It simply dries the fruit, vegetables, and jerky quickly and evenly in very less span of time. The appliance can also be dissembled conveniently when required. Since its all components are dishwasher safe then you can wash them easily. This astonishing food dehydrator provides great reliability and ultimate usefulness to the buyer. ​This food dehydrator is quite easy to clean as you can wash them in a dishwasher. Due to the adjustable thermostat feature, you can set its temperature from 90 degrees F to 160 degrees F as per the nature of the food. The horizontal airflow system helps in drying out the food much faster and you do not have to move any trays in between the process at all. The unbreakable trays of this appliance are capable of handling in excess of 30 pounds. 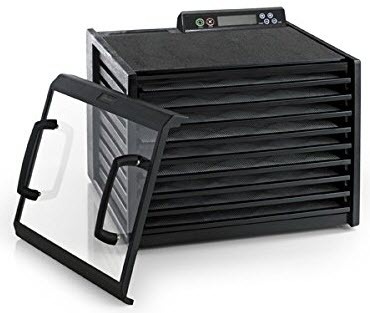 This food dehydrator provides faster dehydration of the food owing to the horizontal airflow and there is no requirement of the rotation of the trays also. 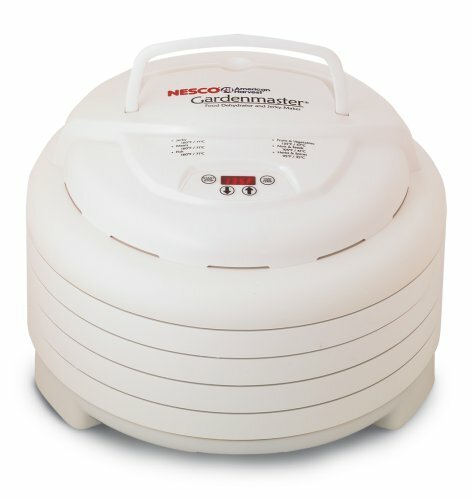 The Nesco American Harvest FD-1040 Gardenmaster creates some noise while drying out the food which might irritate certain people. The fan is also noisy and starts creating the noise from the beginning of the process. 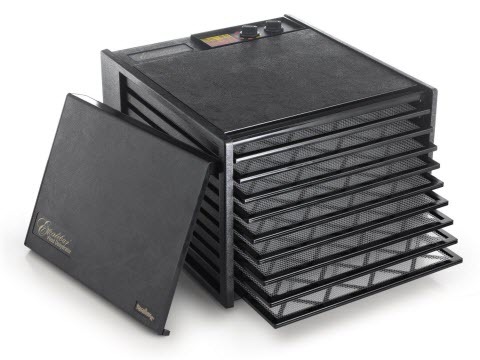 The L'Equip FilterPro food dehydrator originates with a good assortment of trays that can be expanded up to 20 for the bulk drying. It also possesses valuable plastic mat inserts which help in stopping the food items from getting stick to the trays. This L'Equip food dehydrator dehydrate the vegetables and fruits fairly uniformly without losing their originality of flavor. It also devises a beneficial timer as well as adjustable temperature feature. The plastic inserts help in stopping the food from getting stick to the trays. All the food items get evenly dehydrated. It is essential to evenly cut the ingredients to certify similar drying time. It dries out delicate food items more quickly. It consumes very less power consumption. There is a digital LED time as well as temperature display screen in this appliance. It looks like a plastic machine which is not so much good looking. While drying out the mushrooms sometimes it gives out uneven results. You can wash it with hands only as it is not dishwasher safe. There is no beep or sound is made to notify you that the timer is over. You cannot see the process as there is no see-through passage is given. The last name in this list is of Tribest Sedona SD-P9000 food dehydrator which is a comparatively new dehydrator in the consumer market. This is manufactured by a company known as Tribest which also manufactures juicers and other home appliances useful for a healthy diet. 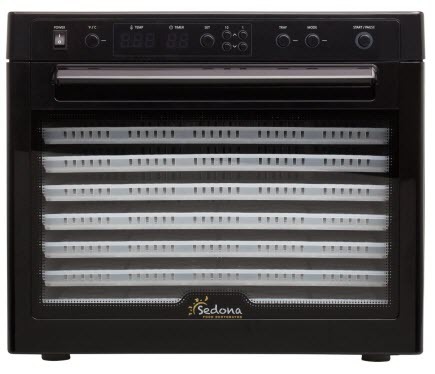 Along with the nine shelves measuring around 15 x 13 inches, the Sedona SD-9000 food dehydrator offers a large capacity to the user. It every single tray offers approximately 1.4 sq. ft. of the drying space. It also looks like a counter-top microwave in the kitchen. This is an attractive and modern designing appliance. Its digital display along with the digital adjustable thermostat is quite easy to access. You will get the countdown timer which functions up to 99 hours. A cut-glass door is provided so that you can check the dehydration progress without opening the appliance. The buyer gets one-year limited period warranty also. Since this is a new machine, it does not have a proven track record. Q: At what temperature should I dehydrate my food at? The temperature at which the dehydrator has to be set totally influenced by the nature of the food you want to dry out. For example, hard food items like meat and fish require high-temperature heat whereas subtle food items like herbs and spices need very less temperature for dehydrating. There are some dehydrators manufacturers which offer recipe book along with the temperature setting instructions that might be very helpful to the user. Q: I want to buy a reasonable food dehydrator for my family but the appliances which have a timer and adjustable thermostat feature are more costly than the normal models. Please suggest? The food dehydrators which have both these features i.e. timer, as well as temperature control, are a little bit costlier to buy due to the addition of such useful features. If budget is not the main issue then you should go for such food dehydrators. Q: If I switch ON the timer and go out for my work, then will it shut down automatically? Yes, the timer is quite useful for the people like you who have busy schedule whole day. So, when you go out, set the timer of the appliance accordingly and it will shut down automatically when the process gets over. Q: What is the temperature control feature in a food dehydrator as I am a new user of this appliance? A temperature control or the adjustable thermostat allows you to set the temperature or the heat of the food dehydrator as per the type of food you want to dry out in it. Q: I do not have any knowledge about the setting of temperature in a food dehydrator according to the food. Please advise what to do now? Do not worry if you are a new user of the food dehydrator. You will get an instruction booklet along with your appliance that will guide you about the ways of setting up the temperature in the appliance. In fact, some of them also state the degree of temperature on which you can dry out your food item perfectly. Q: I have heard that adjustable thermostat feature is beneficial for the drying out of the hard and tough food items like meat or jerky. Is this true? No, this is not a true thing about this feature. The adjustable thermostat helps you in the setting of the temperature according to the type of food you want to dry out i.e. whether hard or delicate. Q: If I do not have the timer in my food dehydrator, then can I buy an additional timer for myself? Yes, you can, of course, buy an additional timer from the market or through the online shopping websites. Q: There are numerous brands and models of food dehydrators which are available in the market with a timer and temperature control. How will in the know that which one will suit me? You just have to consider the type of food you want to dry out the maximum in your appliance and what will be your budget. 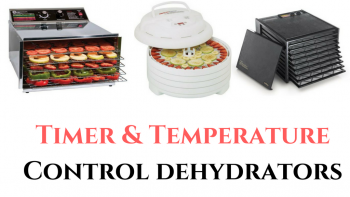 We have listed some of the best food dehydrators which possess these two features. You can check them and select the appropriate one for yourself that matches up to your needs perfectly. Q: Does the appliance with timer and temperature control consume more power consumption? No, these features do not affect the power consumption at all. It will consume the same power which a dehydrator expends without the presence of these features. Q: While using my food dehydrator, the timer stops working in between the process. What to do now? You can contact the manufacturing company of the food dehydrator through the customer care assistance or can send them a mail also. If the product is within the warranty period then they will replace it immediately. 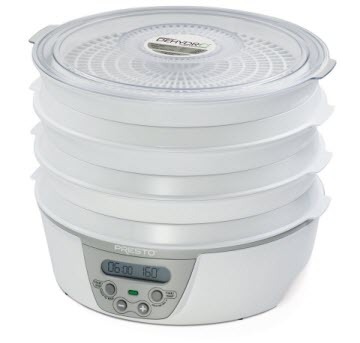 Q: Do the features like timer and the adjustable thermostat always present in big size food dehydrator? No, this is not obligatory. These features can be present in small size as well as big size food dehydrators. After reading this article, it must be cleared that drying out a food in a more convenient manner is possible if it has features like timer and temperature control in it. You just have to cautiously consider that which kinds of food you will maximum dehydrate and how much you are eager to spend while buying a food dehydrator. All the above products are reviewed cautiously so that you can select the best appropriate appliance for your home easily. ​See, if the assortment of convenience is more important to you, then you must check the above two features i.e. timer and temperature control in the appliance for sure before buying. It is beneficial for you in the long run also when you get busy in your family events or get together. You will certainly feel a sense of relief while using these two features. ​If you have any further views or comments regarding the above lists, then please share with us by commenting below. It will be very helpful for us in making this article more useful for the readers like you.